At the first sign of a worksheet my 6-year-old starts yawning so I’m always looking for math games to make our learning fun. 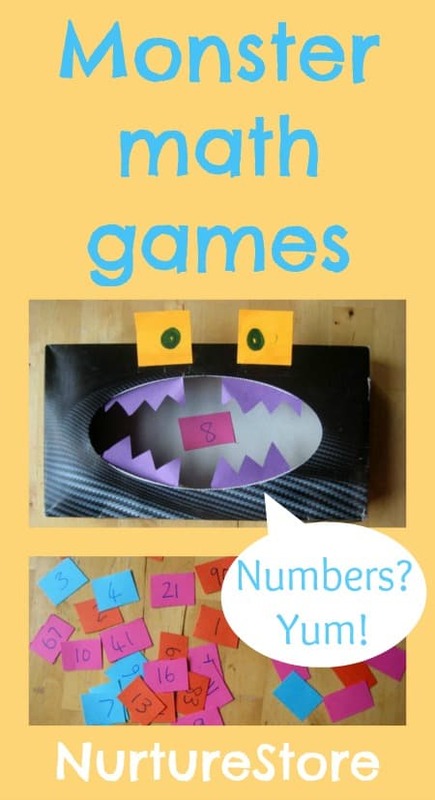 This monster math game turned out to be a big hit, and is adaptable so you can use it to play with lots of different math concepts. 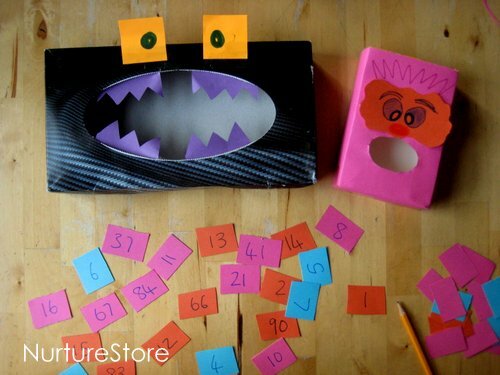 Here’s how to make Math Monsters who love to eat numbers! Start with two cardboard boxes, one big and one small. 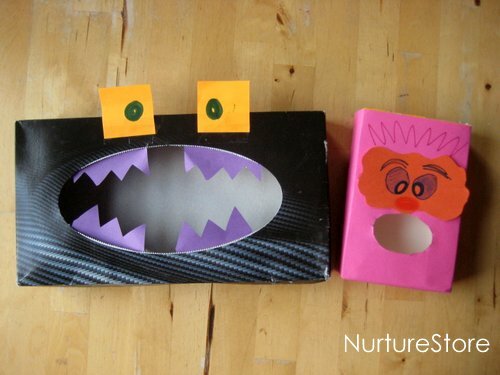 Each will need a hole in the front to be a monster mouth, so a tissue box is ideal but you can also cut out a hole. 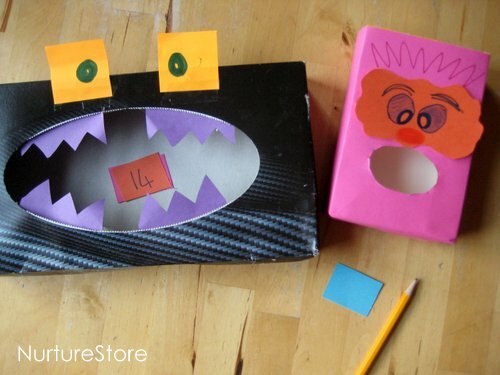 Then you need to transform your boxes into number-eating monsters. I used some card, marker pens and sticky tape for a quick and easy transformation. The monster fangs were a great addition as they tickled my daughter’s hands later in our game, which gave her lots of giggles. 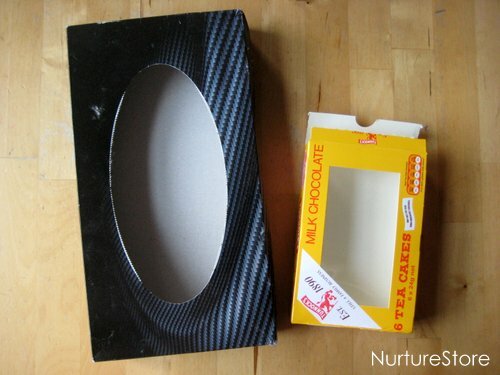 You’ll need to be able to get the contents out of your monster boxes, so you might need to cut off the top if your monster’s mouth isn’t big enough for you to reach inside. 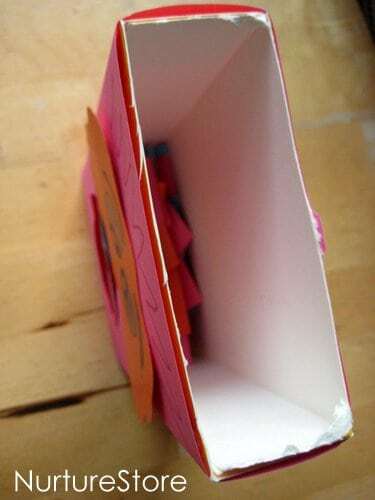 Then make a set of number cards, along with some blank ones. 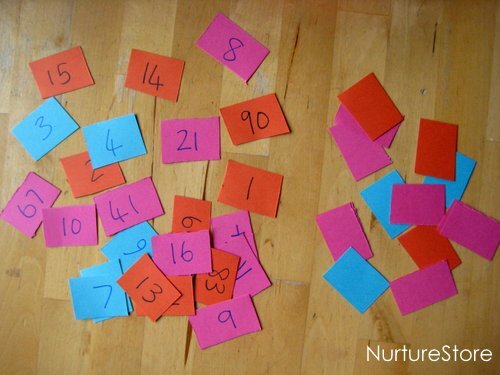 You can write on numbers that match the math concepts your child is working on – take a look at our ideas below. We named our new pets Mega Monster and Mini Monster, and the play began…. We used our monsters to practice comparing bigger and smaller numbers. Mega Monster only likes big numbers, and Mini Monster only likes small numbers, so my daughter had to pick a pair of numbers and feed the right one to each of her monsters. She loved making monster-munching noises as they scoffed their numbers! We also used the spare blank cards to get in some written number practice. She picked a card for Mega Monster, and had to write a smaller number on the card to feed to Mini. We also played the game with all the numbers spread out on the table. We picked a card for Mini and then had to find a bigger number for Mega to eat too. This is a good math game for children who are moving away from using actual objects to represent numbers and are working on using abstract numbers, and tens and units. 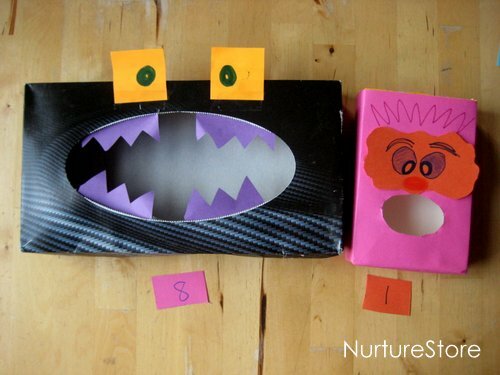 Once you’ve made your math monsters there are lots of different ways you could use them, depending on the age and stage of your child. Toddlers might like to simply feed the monsters cards, counting each one as they place it in their monster’s mouth. Or you could use a set of cards numbered one to ten: jumble them up on the table and then find the right ones to feed your monster in sequence from one to ten, or ten to one. One monster could only eat odd numbers, the other only even ones. Or you could fill the monsters with numbers, dare to put your hand in their mouths to pull out one from each, then practice your addition by adding your two numbers together. Games for math are always going to be more fun than worksheets. The only time worksheets are not boring is when they have to be filled in based on real concrete experiences. I love this! I’m thinking of having my son chose between 2 numbers, the bigger number in the big monster and the smaller in the small box. And keep offering him 2 numbers at a time. Pinned! My son is only two, but I’m thinking this might be a great rainy day activity. He would love to put things in the mouth and dump them out again. 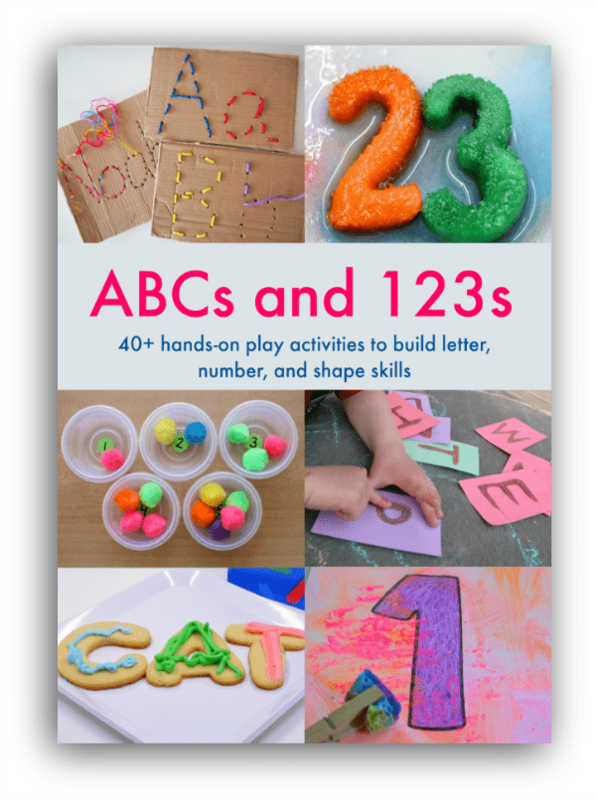 Good for counting w/ one-to-one correspondence! For older kids, I was thinking three boxes (small, medium, and large) would be good for sequencing from least to greatest. I love these! We made them awhile ago, and pulled them out again this week to play with numbers for ‘N week’. I loved how my son quickly learnt the importance of place value. We were using numbers 1 to 31, and feeding the larger of two randomly selected numbers to the big monster as you’ve described. But even if he couldn’t say the name of the number, he could recognise their relative value by looking at the tens digit, and then, if necessary, the units digit. Awesome learning tool. Thank you.